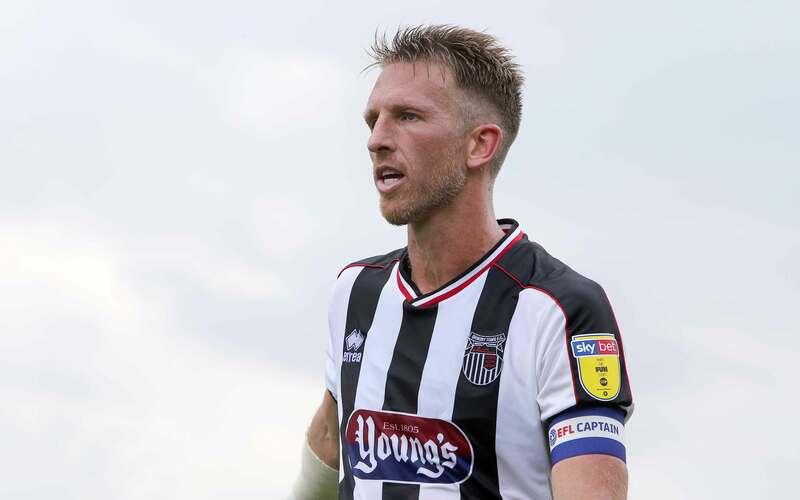 In the latest of our series of Q&A sessions, Kev Williams talks to former Buckley Town player Danny Collins who currently plays his football at Grimsby Town in EFL Divison 2. Danny is well respected by all at Buckley Town FC and his Sunderland shirt still proudly hangs in our Committee Room. We thank him for taking the time to do a Q&A in what will be an interesting read for many, especially for any young and aspiring players who believe they can still make it in the game. What are your memories of playing for Buckley Town? Did you ever think you could go on to do what you did whilst at the club? My memories of playing for Buckley are that I started playing for them when I was around 18 years old. At that time, it was a step up for me because I had been playing in aged football with lads my age, so to now be competing every week against men of all ages and sizes I had to adjust to the physicality of the league. I was still relatively small in physical appearance and hadn’t fully developed yet. I was playing in central midfield and although I was fairly quick and had good ball control I would still be fouled regularly and at times eased off the ball due to my slight physique. I had to be mentally tough to deal with this and try to improve and work on both my physique and other assets to my game. As the seasons went on, I kept on improving, scoring and making goals and getting attention from professional clubs. From trials with Wrexham, Tranmere & Cambridge, I eventually signed for Chester City in the conference when I was 21…. If I’m honest by this time and the age I was at I thought my chance of becoming a professional footballer had gone, but it shows if you work hard and perform well you don’t know who is watching. At Chester I went from a centre midfielder to a centre back. One of the coaches seen this as my position so they moved me in training and that was the end of my days as a midfielder. It was different from what I had been used to playing but I adjusted my game and so for the last 18 seasons I have been a defender. From grass roots to the Premier League, what would you regard as your best times playing football? My time at Sunderland is the best time I have had as a footballer. I moved there when I was 24 after winning promotion to the Football League with Chester in 2004. I had played 10 games the next season for Chester in League 2 and I was playing well. I knew there were a few clubs showing interest in me and my agent called to say Sunderland had made an offer which Chester had accepted. The next day we travelled up to the north east and I signed for Sunderland. Sunderland were currently sat in 4th in the Championship table so again it was a big step up for me from the level I had been playing and also the facilities, fanbase and expectations of the fans. I remained at Sunderland for the next 5 seasons playing over 150 games, winning promotion to the Premier League twice and also suffering one relegation. It is a great place to play your football in front of over 40,000 passionate fans. I also picked up the player of the season award twice and was given the honour of captaining the side in my final season there. You represented Wales 12 times, what’s it like walking out to represent your country? It was a great feeling to pull on the shirt and represent my country. My debut was in 2005 v Hungary which we won 2-0. My best memory of playing for Wales was the game against England at the Millennium Stadium in 2011. Although we were beaten 2-0, the game was played in front of 70,000 fans and the atmosphere was fantastic. What’s your proudest moment in football? I would say my proudest moment in football would either be making my debut for Wales or winning the Championship with Sunderland the second time as I had played over 40 games that season. I am into my third season at Grimsby now and it has been pretty eventful. First season we finished mid table, last season we were in a relegation battle but pulled clear with a good run of results with 5 games to go, and this season has been a mixed bag….we had a poor start to the season but recently we have been in good form and are now looking to push on and possibly force our way into the play offs with 20 games still left to play. What advice would you give to youngsters playing the game? The advice I would give to any youngsters either playing local football or at a professional club is to train hard every day with the right attitude and listen to the advice from coaches. Off the pitch, try and look after your body in terms of eating the right foods, limiting alcohol intake & getting a good amount of sleep. You will have ups and downs as a footballer, such as not being selected to play, having a bad game or picking up injuries. You have to be mentally tough and don’t dwell on the downs too much and keep pushing yourself to achieve more in the game. The best players I’ve played with are – Gareth Bale & Ryan Giggs. The best players I’ve played against are – Thierry Henry, Cristiano Ronaldo, Steven Gerrard & Didier Drogba. The greatest of all time? Who was it? I wish you all the best for the rest of this season and in the future. To all the young players, just keep working hard on your game, believe in yourself and you never know what can happen! Thanks to Dale Ladson, Press Officer at Grimsby Town FC for supplying the photo. This entry was posted in Club, Featured, Latest News. Bookmark the permalink.